HMP Dumfries currently work in partnership with Dumfries & Galloway Criminal Justice Community Payback/Unpaid Work to supplement the work and services they provide. A recent addition to this partnership is pallet work. Prisoners strip down pallets and make the wood into kindling to support the local 'Winter Warmth for Older People' Project within the Dumfries and Galloway region. This type of work is ideal for HMP Dumfries to provide learning and employment skills to prisoners within custody, whilst also providing a sense of self-esteem that they are doing something worthwhile for the community. 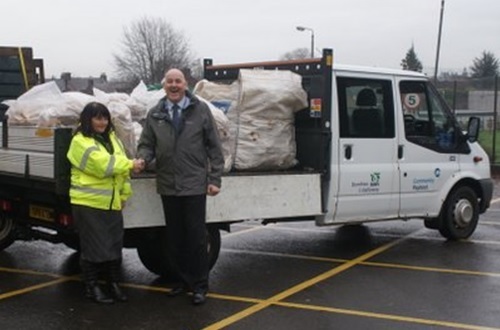 Deputy Governor, Andy Hunstone said “this is a welcome partnership initiative between HMP Dumfries and Dumfries & Galloway Criminal Justice Community Payback which has benefits to prisoners in custody and the community during a particular time where people are at risk due to the extreme weathers”.